St Nicholas Cottage, holiday cottage Salthouse, Views over salt marshes. St Nicholas Cottage is a newly refurbished quirky holiday cottage Salthouse, right on the North Norfolk coast. 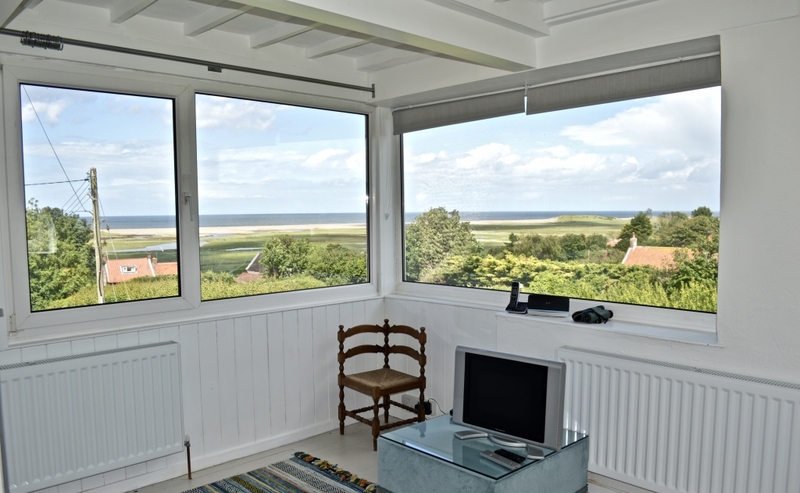 From the sitting room you have the most beautiful views over the salt marshes towards the sea, giving an ever changing sky and vista. It is owned by Jane, who also uses the house for her own family holidays. The accommodation is upside down with the sitting room and two bedrooms on the first floor and the dining room, kitchen and shower room on the ground. St Nicholas Cottage is a bird watcher’s paradise with far reaching views over the salt marshes and sea. French doors from patio and parking area. Dining Room: as you enter the cottage from the rear parking area you come to the dining room. A newly fitted wood burning stove provides for cosy evening meals. There is a tiled floor and a comfortable chair to sit and read in. Table and chairs, sideboard. Door to front. French doors to rear. Kitchen: again newly fitted and well equipped with large American style fridge, freezer, dishwasher, microwave, cooker with ceramic hob, grill and oven. Smaller appliances include a toaster, and coffee machine. Underfloor heating throughout. Porch: door to front of property great place for taking your boots off or drying the dog! Shower Room: corner shower cubicle, bidet, basin, WC and heated towel rail. Stairs to first floor: please note these are open to one side, there is a hand rail. Maybe unsuitable for very young children. Hallway with stripped and painted floorboards, bookcase with good selection of books. Bedroom 1: a pretty bedroom with stripped and painted floorboards, pine double bed, side tables and lamps. Hanging pegs for clothing. Bedroom 2: larger than bedroom 1, with king sized bed (can be two singles) side tables and lamps. Small wardrobe, chest of drawers, and hanging pegs. Lovely views over the church and to the salt marshes. Stripped and painted floorboards. Outside: the cottage is reached via an unmade track that although narrow in parts is accessible with a decent sized car. (we have a Fiat van and it has been fine) The parking space to the rear and the road are shown in the photographs, but if you would like to discuss please do give us a call. There is a paved patio and parking area to the rear with garden furniture. French doors giving access to the cottage. To the front is a paved area. The area surrounding the cottage is beautiful with the church to the rear. Walks can be had directly from the house, to the sea, salt marshes or up into the lanes. The charm of the house is its peace and quiet and the views. It is perfect in any season for anyone wanting a real getaway to bird watch, write, paint or just relax. The Dun Cow is a short walk away which serves excellent food. Cookies Crab Shop, made famous when Rick Stein visited is again just a short walk away. There is a village shop in Salthouse selling basics and beef from the marshes. The Coasthopper bus comes through the village regularly giving public transport access along the whole coastline, if you want to leave your car behind. Salthouse is right on the coast and is next door to Cley famous for the RSPB bird reserve. The cottage will give you front row seats for the Autumn migration.